Images of the Orion Nebula with its hot gas bubble. At left is an x-ray image taken by the XMM-Newton, color-coded for photon energies. 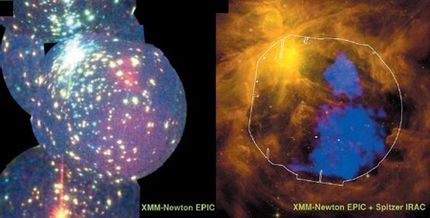 At right is a composite image taken by the XMM-Newton and a mid-infrared image from the Spitzer Space Telescope, with the plasma in blue. Image credit: Manuel Güdel, et al. ©Science 2008. On a large scale, the Milky Way is considered to be a vast cold region punctured with isolated hot clouds and star clusters. While much of this space is cold and empty, researchers have recently discovered the phenomenon of funneling hot plasma. Flowing plasma may funnel from one region to another through empty space, connecting otherwise isolated clouds and clusters throughout the galaxy. Researcher Manuel Güdel at the Paul Scherrer Institut in Switzerland and colleagues from Switzerland, France and the US have recently observed the plasma flow phenomenon for the first time in the Orion Nebula. Based on images taken with an x-ray satellite called the XMM-Newton, the researchers observed the existence of a million-degree plasma flowing from the nebula into the adjacent interstellar medium, and then into the neighboring superbubble Eridanus. The Orion Nebula hosts several thousand young stars (less than a few million years old), and almost every one of these stars vigorously emits x-rays. The satellite’s cameras observed the x-ray stars, but it also picked up a separate, fainter emission in the extended parts of the nebula. Upon investigating the spectrum of this emission, the scientists discovered that the energy indicated a million-degree plasma. A dense veil of neutral gas probably hid the hot plasma from previous observations, such as those by the Chandra X-ray Observatory, which didn’t detect a thing. Not only did the researchers discover a new phenomenon, but they think they know what causes the super-hot, large-scale plasma. As the scientists explain, the energy required to heat such a monstrous gas is “severe.” The young stars in the Orion Nebula don’t seem capable of hosting such a hot, energetic structure. But the researchers think that sufficient energy could come from the high velocity winds emitted by stars in a dense region in the nebula called the Trapezium – a small group of massive stars that is almost solely responsible for the optical light we see from the Orion Nebula. The winds from the Trapezium stars colliding with the surrounding gas could generate enough kinetic energy to create shock waves that can heat up the gas to millions of degrees. In most cases, such a hot plasma would stay confined in its cavity, contained by gases and dust that don’t mix with the plasma. But in this case, the plasma and the surrounding cooler gas have very similar pressures, and this near-pressure equilibrium makes it possible for the plasma to leak out of its cavity and into cool interstellar space. Flowing at a velocity of a few tens of kilometers per second, it likely heads toward the nearby Eridanus superbubble, replenishing this vast interstellar region with hot gas. The discovery of the pervading plasma in Orion is unusual because such a large-scale plasma was previously thought to require large groups of massive stars for its energy source, which aren’t found in the Orion Nebula. If hot plasma can occur in a region with a small number of massive stars, the phenomenon might be more common in the galaxy than astronomers previously thought. As the researchers learn more about the possibilities that can occur in our galaxy, they also better understand the early history of our Sun and our Solar System, and maybe others like it. More information: Güdel, Manuel, Briggs, Kevin R., Montmerle, Thierry, Audard, Marc, Rebull, Luisa, and Skinner, Stephen L. “Million-Degree Plasma Pervading the Extended Orion Nebula.” Science, Vol. 319, 18 January 2008. Seanpu, your comments aren't very useful. There is plenty of gas out there. And plasma can be >99% un-ionized and still be called a plasma. Be interested to know the chemical makeup of the plasma and any quesses on enery of the molecules/ions contained in the plasma. seanpu: What makes you think that the people who look and see these things are wrong, and you are right? How does your theory fit the observations? "There is no rock on the moon, only green cheese, so the observations of basalt and silica must be wrong! And cheese would melt at the reported daytime temperatures, so that measurement must be wrong too!" Learm, I'm not sure what you're insinuating. This article is word for word what the Electric Universe theory advocates, the only divergence from conventional theory is that electromagnetism is the driving force behind the dynamics of the plasma, not gravity. NO THIS DOES NOT!! Please re-read and research such theory before making such rash comments. Plasma is Aetheric force and it is produced by suns and stars,stars are the connective fabric of our cymatic universe and frequency that is created by our gas planets comes to the earth in our galaxy for our life process here. There is a large central sun in our universe and gas planets make the oxygen and hydrogen from spinning mass and proper speed rto create the gases frequency and all you have to do is think of each gas planet and its size and speed and understand that this engineered system is no accident. The sun is a frequency burn and there are huge hydrogen and oxygn lines that provide the gases necessary for its burn. A sun lasts about 10 thousand years and new ones just as all planets are grown. The planet starts as a crystallized ammonia and that core material draws energy to it as all planets have growth components brought to them as they grow their layers. All metals are salts,they have crystalline structure,that crystalline ammonia core draws the grid field to it by reasonating at a lower tone and that is how gravity is created. All orbiting spheres have that grid and core.Check out the Google Video "Cool Salt" to get the clue of how frequencies propagate as a geometric grid when the "Music" is concordant. That is how everything stays itself in its place. The rings are also cymatic of course and we even have rings at 48 thou and 96 thou that keep our gases in. Oxygen is not made by plants,no matter how much you boys scream. I have fully explained the genesis of the carbohydrates in a plant on other forums.The universe is rather simple when you have the right clues.Black holes are simply explained also as I have stated today in this forum in that area.We are in a period of grid revv also and that is what is enhancing our weather and heating our magma.Theres more and more and more to creations story. Nice, you got it. Dead on, mate.